This really should have been written up sooner, especially since Shinmaru over at Unmei Kaihen has put up a good post outlining the purpose behind those OPs and EDs and I’ll just expand on it a bit further. I think that for most of us, the idea behind those sequences are fairly obvious, but it never hurts to put it in writing so that any misconceptions (mine or the readers’) can be dispelled. So yes, Shinmaru covers the business side by noting that these sequences are a way for music companies to bring new artists to light and expose their music to different audiences. If you want to divide the domains between OPs and EDs, then OPs generally give us an idea of what the series is about and since it’s generally the first thing the viewer will see, it’ll most likely use good art/animation to draw the audience in. That’s not to say that there are times when the studios will try to be misleading. If you want a good example, look no further than Renkin 3-kyu Magical? Pokaan, which creates expectations that the series would involve some great magical, cosmic struggle with some yuri thrown in for good measure. Of course, audiences hoping to get that kind of action are bound to be disappointed by the story, which is mostly about us watching the characters in the OP go through hilarious hi-jinks as they try to adapt to modern-day society. But hey, if the goal was to make the audience curious about the show, it worked! Anyways, my favorite OPs tend to be relevant to the story, so the ARIA OPs are always going to get a thumbs up from me. But when it comes to a strong mesh between the opening and the actual story, I think Gankutsuou’s “We Were Lovers” stands out the most. That the lyrics are in English gives us a grasp of what’s going on in the way it captures Edmond Dantes’s sentiments and the feelings of vengeance that stir deep within him. So taken in sum, the music is really poignant in the way it captures the pain, the lyrics give the audience a feel for how the story unfolds, and the art/animation gives us a glimpse of Gonzo’s effort in the series. That it was composed specifically for the anime rather than sell CDs probably helps too unless I’m gravely mistaken and this got a lot of people to buy Jean-Jacques Burnel CDs. But EDs. Yes, it’s true that there’s no real discernible pattern that one can put one’s finger upon, and the closest that I’ve come is to suggest that it’s there to ingrain themselves in the viewer’s mind by providing the lingering effect that will allow people to contemplate on whatever has just taken place in the show or to make us look forward to the next episode. That most of them don’t really deliver this kind of effect means that it’s probably wrong and that there actually is no pattern, so I’ll just save myself the hassle and say that the ones that I enjoy the most do achieve this effect, and I love them all the more for it. So which shows manage to nail this down pat? Well, Wolf’s Rain’s “Gravity” definitely comes to mind. The lyrics within the song give us an idea of how long the wolf pack has been searching for their paradise, and though the conditions are right, there’s still a struggle that they must overcome if they’re to reach it. These feelings tie in with the show rather well and definitely leaves that lingering effect as we too come to empathize with their need to seek out that sanctuary and their determination to make it. Or how about Welcome to the NHK’s “Odoru Akachan Ningen.” That sequence sure ties in well with in the series. Kenji Ootsuki’s harsh vocals are pretty good at capturing the insanity possessed by those who are looking to regress by turning into that “kidult” rather than live up to the demands of society and nails Tatsuhiro Sato’s state where he withdraws from society rather than confront it directly. The lyrics and animation do a good job of capturing his delusional tendencies borne from his crazed mindset that it’s a mad mad world and this song nails it. I might not have a great deal of affinity for it, but I’ll be damned if it doesn’t leave that strong impression behind. I certainly remember it a lot more vividly than I do the show’s second ED at any rate. OPs are definitely more clear-cut than EDs and in general, they hit their purpose better. EDs are not as memorable because though we might want them to leave behind that strong association with the series, they generally do not. That’s why the two examples I cited will stay with me: they enrich the viewing experience by matching the content of the music and animation to the show’s primary plotline, ending each episode on a note so as to render the entire entity unforgettable. I read somewhere a long time ago about OP’s being not only to introduce the audience to the series, but to get them hyped up/ into the mood as well. Thus, many OP’s tend to be more fast paced. On the other hand, ED’s are used often to unwind the watchers, so they usually take a more relaxed route. Perhaps one recent example of this would be Railgun. Of course, there are plenty of exceptions and I’m sure it does not hold true for many. My favorite OP/EDs are usually where I like the song and the animations. I definitely use the OP to judge what the anime is going to be about; content-wise and what art style it uses. If I like the song enough, I’ll usually be listening to it on repeat for a while. When I am listening to them, the OP/ED animation sequences pop up in my mind. The interesting thing about Gankutsuou is that its OP/ED are sort of the opposite of how people probably expect those types of songs to be, in terms of tone — the OP is the slower, more meditative tune, while the ED is the more quickly paced song. I always liked that. Somehow that rings a bell and I think I heard that from one of the AX panels that I attended last year. As for EDs, that seems to be a reasonable take, though for someone like myself who enjoys slow-paced stuff, there’s quite a few that just never manages to stand out. And yeah, Gankutsuou has quite an awesome OP. Not often that I hear male artists, but that one in particular may very well be my favorite because of how well it opens up the series. It’d be interesting to do a correlation of how well the OP matches up with the show. The only show that I can think of that might not have the level of impact that the series does are the OPs to the first FMA series which were kind of meh, but the show proved to be really enjoyable. Slow, meditative, but also good. I think Sora no Woto’s OP is also a good example of a slow piece that uses a folk vibe that is far calmer than your usual pop-ish track that gets you hyped up about the show. Likewise, “Girls, Be Ambitious” is far more sugary in its delivery and lyrics, and that effect makes for a good change. I can actually remember the ED that way. In reading this I began to wonder exactly what an opening and ending themes purpose is in contexts outside of anime. I mean really in movies what is the purpose of a closing song? Most people just get up and leave anyway. When I was searching around I did find a little tidbit of information that said Opening and Closing themes were originally so important during the days of radio when an audible queue was necessary to signal the beginning or ending of a show. So ultimately I think ED’s that are memorable get by thanks to the quality of the music or the quality of the animation or some combination of the two. There are upbeat EDs and there are downbeat EDs but how they relate to show I think is what will make one memorable and another forgotten. 1. Airmaster ED -Rolling 1000Toons by Maximum the Hormone – The song is insane…the animation is just lots of characters running but it does fit the high octane show and comes off far more memorable than the OP for me. 2. Monster ED1-For the Love of Life by David Sylvian- Is absolutely perfect for the atmosphere of the show. The song itself is kind of so-so. The accompanying animation is appropriately creepy but unrelated. The complete package freaks me out. 3. Outlaw Star ED1-Hiru no Tsuki by Arai Akino- Maybe some nostalgia bias here but the song is hauntingly beautiful to me. The animation appears to be some kind of concept drawings for…something else I never quite figured out. The song is what wins the ED a place in my memory but the drawings stuck too because i wanted to see a series animated based on those concepts. The purpose of OPs and EDs could depend on the series. Many are made as a “hook” to get you into the feel of the show, either by featuring the characters and an appropriate song, like the Evangelion or One Piece OPs for example, or creating the feel using a specific art style and not necessarily giving you an idea of what it’s about, like the Mushishi or Elfen Lied OPs. Others, like the Hanamaru Kindergarten and Bakamonogatari OPs, seem like fun fan omake to showcase certain characters. But together with all this, the other purpose of promoting artists is present. These factors work together to give us the variety of anime OPs we have. Since EDs are less likely to be watched by people because they occur at the end of the show, usually not as much effort is put into them. But I think the same factors of the OPs go into the EDs as well. I think one repeatable pattern in OP/ED design is that while the OP is used to introduce elements of plot and/or setting, the ED is used to show relationships between characters. One example is the OP and ED for ‘Karin’. The OP hits strongly on the vampire theme, while the ED has no supernatural elements at all and focuses on a sweet moment (sorry) between the leads. Count me in as one of those people who’ll sit through the ending credits scroll in movie theaters. Somehow, I really enjoy listening to the music play since a lot of it is really good orchestral stuff that catches my fancy or somehow, it ties in really well with the movie to make the ending really satisfying. Agreed with two of the examples, though I can’t say I’m all too fond of “Hiru no Tsuki” probably because of reverse nostalgia. :p Even then, I never figured out how well it tied in with the show and I was never a huge Arai Akino fan to begin with. I’m actually impressed by Elfen Lied’s OP as well as Sora no Woto for the Klimpt factor. The artwork was really something to look forward to in the former since it spurs one’s curiosity to look further into the show. Sadly, the effect isn’t a huge one since I stopped after one episode. As for Bakemonogatari, Sorrow-kun made an interesting point about how some of the OPs depict the struggles and feelings that the character in question suffer from, so you can learn a lot about them through those OPs. That possibility that you suggest for EDs might be a recurring pattern for some shows, but I’m not too convinced. A lot of them show the characters in various states of unwinding/relaxing, but I’m not sure that relationships is a big part of it. Of course, my sample set could be pointing me in the wrong direction altogether, so I’ll have to keep an eye out on the whole relationship aspect to see if there’s any ties that I can notice through that. I guess business always takes part in anything including the OP/ED as a mean to promote artists. That’s why I usually feel very good about the instrumental OP/EDs. Their intentions and feelings are more genuine, imo. Some example includes Haibane Renmei, ROD or Guin Saga’s OPs. Quite relevant. I may have to do a post of all the OP/EDs that are purely instrumental at some point now because those have been some of the most memorable pieces out there. I’ll add 12 Kingdoms and Victorian Romance Emma as other good examples since those are definitely list-worthy! But yes, I would agree with most people here that well-done OP’s grab the watcher’s attention and gives an idea to what the show will be about. Well-done ED’s summarize what has happened and embody the emotions felt after watching an episode. 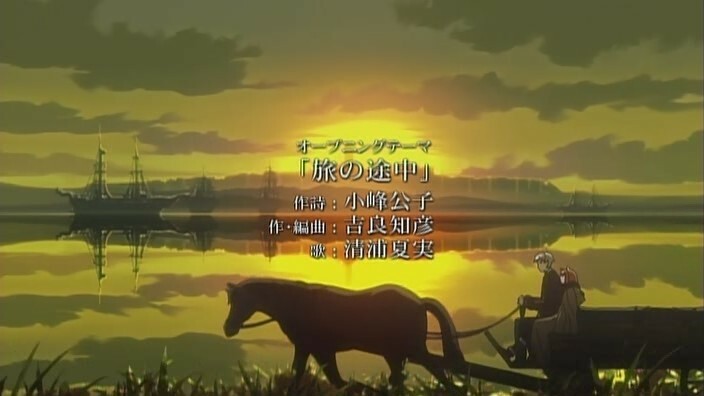 Mushishi’s OP’s did a wonderful job at reinforcing the mood. Elfen Lied’s summed up the sadness of the series perfectly. Azumanga Daioh’s OP and ED reinforced the entire series’s ridiculously amusing nature. I would list off more if I watched more anime. I’ve done a list that shows my favorites, so I’m not going to list my favorites. I will say that I love OPs and EDs alike, and right now the two standout OPs would be the OP for InuYasha: The Final Act and the OP for Air Master (which I only just started, it also has an awesome ED, and that was already mentioned above). Also that one from Bakamonogatari that everyone was obsessed with, but I haven’t gotten that far into the show yet, because I find the show boring, and if it ended at episode 6, I would give it a 2. Well, they could try having someone narrate the opening credits in some somber voice with an instrumental portion playing in the background. That’d make for a nice change of pace from the pop stuff since I don’t think we get enough instrumental-only OPs and EDs. Boo, Bakemonogatari’s talking heads is something that’s a love it or hate it I guess. As for Inu Yasha, I haven’t really touched the OPs or EDs for Final Act so I’ve just kinda let that pass me by. More Natsumi Kiyoura is never unwelcome. That OP was particularly good since it captured the traveling nature of the show and had a good melody to boot!